Today I started a new sadhana. The results from the last sadhana I did, Sodarshan Chakra Kriya were fantastic, and I’d been waiting for another sadhana to make itself known. What’s a sadhana? Simply a daily spiritual practice like meditation done for forty consecutive days. On the weekend, while cleaning out my bedroom, I stumbled across a copy of Infinite Energy and Prosperity Meditation, taken from Anmol Mehta’s wonderful website. Perfect timing – the conversation after class on Saturday had been about being authentic while making money. One of my students is feeling a strong calling toward a yogic life, and is figuring out how to reconcile that with his current profession, and what he may want to actually spend his time doing. It’s a conflict that many feel around money – as if money was somehow “bad”, or “dirty”, or making money wasn’t a “good” way to live. It’s not true of course, money is just the material manifestation of energy, and it’s usually given in exchange for value offered. There is an idea that if one was to shift to living one’s passion, it would be impossible or difficult to make money. Problem is, if your beliefs around money are anything like this… this is exactly what you’ll experience. You’ll feel “bad” about charging for your services and you’ll be reluctant to chase your passion because of fear you won’t be able to make enough money. That conversation had got me thinking about value, and abundance. So when I found this print out I must have made six months or more ago and yet never used, it felt like this was the sadhana I needed to do right now.- Not because I have a lack of either of those things in my life. On the contrary, I feel like I already have unlimited energy and much prosperity. But I’m curious, and I’m willing to be a human guinea pig on behalf of other yoga students out there ;). How can practicing a yogic pranayama and meditation affect the amount of energy and prosperity one has? And pay attention to what changes, or doesn’t change as a result. My life is already set up in such a way that I’m open to abundance, I believe in following my passion and working at providing more and more value to more and more people. I’m doing this through my classes, and through my website. For example, there is no set charge for the Prana Flow Yoga classes that I teach at Pump Dance Studios. We teach for seva, or as service. There are a couple of reasons for this, one being that I don’t want students to experience any financial barrier to practicing yoga. I want people to be able to come along and enjoy a class no matter what their budget. The second reason is that it’s my way to put into practice my belief that by freely offering something of value, abundance will naturally follow. And three months in, class numbers are steadily growing, with new people every week and a core component coming to class after class. I can see that we’ll soon have to see about shifting into a bigger room, and then maybe offering more classes. As we offer more value to more people, we make more money. It’s that simple, and there’s definitely nothing wrong with it. The world can always do with more things of true value. The more value that you can offer to more people, the more money you will make. Having my life set up in this way means that as I undertake this meditation, there are channels for prosperity to flow along. It’s going to be a great experiment, and it’s one I’m going to involve my Prana Flow yoga students in by teaching it in class and encouraging them to commit to their own personal sadhana. That way I’ll also be able to see what results other people get. The meditation itself is fairly simple involving nothing more than mudra, pranayama and mantra. 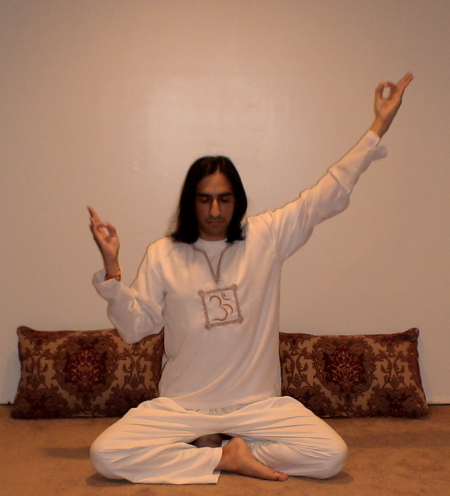 Seated cross-legged, the left arm is raised at 60 degrees and the hand is in Gyan Mudra (thumb and index finger touching, other fingers out stretched.) The right hand is in Surya Mudra (ring finger and thumb touch, other fingers outstretched), the right elbow is close the the ribs and the right arm is bent up toward the shoulder. Both palms face the body. That’s your posture set up (see photo above). Easy right? Inhale, exhale, pump and think Har. Repeat. Today I started with one minute, and it took only two breaths to do that minute. Every day I’m going to add a further minute, until I get to 11 minutes. I’ll do this meditation for forty consecutive days, that’s what makes it a sadhana. I can imagine it might get difficult to hold the arms in place… so I might end up taking twice as many days getting to 11 minutes, if say I do 7 minutes two days in a row, 8 minutes two days in a row and so on. The minute flew by, and I noticed a delicious warmth in my left arm pouring down from my finger tips toward my torso. Can’t wait to do the meditation tomorrow, and to build up to 11 minutes. Bring on infinite energy and prosperity. Let me know in the comments if you give this one a go, and how it works for you.